I enter the small hospital room, adorned with white walls and white boards where his name is scribbled in black writing. Beneath his name is his care plan, followed by contact information for his family. Above the board is an old box TV, hanging from the wall. Fox News is on TV, one of the only shows I remember him watching. He is laying in a hospital bed with his upper body partially raised. He is still, but breathing. I exchange pleasantries with his son-in-law who offered to sit with him until I returned. I was so glad he was able to stay and provide company to him. It was important to me that he not be alone right now. We hug and tell each other we love each other. Then he departs for the night. His shift has ended and we will see each other tomorrow morning when we will make the decision to move grandpa to home hospice. As much as I wanted to get him transferred earlier, it wasn’t possible to get hospice to the hospital any quicker. I tell grandpa that I am moving the chairs around and setting things up. He doesn’t respond, he just continues to breath. His mouth is partially open. As he breathes, only his lower jaw moves as he takes in more air. It seems forced in that it doesn’t seem like he is purposely breathing. The lights in the room are bright. Earlier that day, I made a comment about how bright the hospital lights are and that this place should consider soft lighting. To help fix this issue, I brought an orange lamp from home. I set it up on the stool across the room, plugged it in and turned it on. Then I turned off the brightest light in the room. I find the larger, more comfortable chair and settle it near his bedside as close as I can. I take a seat on his left side. The side I was given at the dinner table when I became a member of this family. Grandpa is laying on his back and his eyes are partially open as if he was watching TV and dozing off. I don’t think he was really watching. He is partially covered in a soft, blue blanket. As I sit, I hear alarms sounding in the hallway. They are not his alarms. Just a buzz of activity on the unit. In the hallway, nurses and doctors are going back and forth between the rooms, an employee is buffing the floor, and carts are being pushed back and forth. It’s noisy and I don’t like it. I imagined Grandpa wouldn’t either. I get up and shut the door. As I do this, I explain to grandpa what I am doing. I return and sit by his side again. We watch TV together. I laugh at the news talking about Hilary Clinton and Obamacare imagining he would have alot to say about these two. A nurse knocks on the door and opens it. As she enters, she asks, “Do you prefer to keep the door shut?” I explained that I did. It was too noisy. She smiles and explains she needs to turn Grandpa. I asked if everything was okay and she explained to me that they turn Grandpa often to help him be more comfortable. Another nurse came in to help and also changed his linens. Once the task was complete, they departed, closing the door quietly behind them. I was given the Wi-Fi code while the nurses were there so I began to check emails while I sat next to Grandpa. I was also checking in with some friends who have done this before and was asking for their advice but soon, I didn’t feel comfortable checking emails. It felt wrong. I wasn’t present to him and I needed to be. I decided to turn on some music and sit with him, in quiet. I turned off the TV and turned on Glenn Miller and Frank Sinatra. I used Pandora and had set up a bluetooth speaker in the room. It took some time to work it out but after a while, the music was softly playing in the background. I had the thought to turn it up a bit louder than I felt necessary. After all, Grandpa has hearing aids. I wanted to be sure he could hear the music. I imagined he would get up and dance if he could. That’s what he did when the music of his time would come one. I sat in the chair and rubbed his arms softly as I talked about the music selection. I told him that if he didn’t like the music, he would have to let me know. I felt his arm move as if in agreement of the music. Every once-in-a-while, the music would stop playing and I would share my frustration with Grandpa. I looked at him and noticed his breathing seemed different since the nurses turned him on his side. I smiled, thinking they must have made it easier for him to breathe. I put my feet up on the end of his bed and closed my eyes. I took in a deep breath and smelled the hospital. It’s not what I want him to remember and I didn’t either so I got up and took out my essential oils. I diffused peppermint with a hint of lavender. I chose peppermint specifically because Grandpa turned to peppermint mints to replace his cigarettes when he stopped smoking many years before. I thought it might be comforting. I then turned out the other light by the door. It was getting late, after 9pm and I wanted him to settle into a sleep. As we listened to the music of the 20’s and 30’s, I would rub his arms or hold his hand often. Sometimes, I would lift the blankets and sheets and physically hold his hand that way, instead of through the blankets. I didn’t talk much, we just sat there…together. I would turn to look at his breathing from time to time. With the orange glow of the room it was difficult to see much movement but I could always see the bottom of his mouth opening with each breath. During these back and forth exchanges of stillness listening to music and breathing checks, I began to doubt my presence. What if he didn’t want someone here? What if he wanted to pass alone? I texted my brother-in-law and mother-in-law these thoughts. They both felt he would want someone here. I suppose but I wasn’t sure. I pondered this for a while, listening to the music and watching his breathing. I was going to leave around midnight. Hubby would take the next shift and stay until morning but that meant the kids would be at home alone, in bed for almost two hours. I didn’t like the thought of that. My brother-in-law offered to come and wait until I got home and hubby returned. But he was going to come earlier than I wanted to leave. I just didn’t want to go before midnight. As we exchanged text messages, I watched Grandpa breathe. I noticed his breathing seemed to be spaced out more than it was before and I told my brother-in-law. He told me he was probably falling asleep and I also just believed he was breathing better because of his new position. But there was a part of me that felt this was him dying, so I stopped texting and just watched his breath. For thirty minutes I sat with him and rubbed his arms. I told him all would be okay. We were all going to be okay. As time progressed, I noticed his bottom jaw wasn’t moving that much anymore. I feared he was going but continued to sit with him. There was no monitor in the room for me to check, I would have to trust my instincts. No life-saving measures were to be taken anyway. While his heart was being monitored in the hallway, I had no idea if anyone was going to share with me if his heart had stopped. I went out into the hallway but no one was there. I walked to the nurses station but no one was there. So I peeked over the desk at the heart rate monitors and found Grandpa’s. The rate displayed, 53. “Hmmm…maybe he IS sleeping,” I thought to myself. I looked for his respirations but I didn’t see any. Realizing that these things can be wrong, I just chalked it up to being an error. I returned to the room and checked my messages. I saw one from my brother-in-law. It was approaching the time where he would be leaving but I wasn’t ready. I told him to just stay home. I couldn’t leave. My entire body was telling me to stay. I returned to his bedside and sat in the chair. I could still see his lower jaw moving but it was much slower than before. Only a breath every 15 seconds or so. I reached my upper body over the side of his bed and laid there. My arms across his chest and I prayed. “Lord, please take him into your kingdom. Please take him quietly, softly, and pain free.” I laid there, with more prayers and listened. “Smile,” by Nat King Cole was playing through the speaker. My eyes closed and my body draped across the bed, reaching out to a man I knew was likely leaving this earth. As much as I wanted him to stay, to have one more conversation with him, I knew he was going. When the song was over, I looked up and noticed his whole body was still. Even though he had been still before, this seemed different. I felt like he was gone. He replied, “We can’t say for sure because there can be a rebound.” I didn’t care to hear him anymore. I turned towards the room. Another nurse said, “Are you going to call your mother?” I stopped, “Should I?” I asked. She said, “Only you can know if it’s best to call her now or after.” I returned to the room. A nurse came in behind me. I moved to his right side and sat in a small chair. I leaned over and rubbed his head and stroked his hair. I began to cry. The nurse was comforting as she listened for his heartbeat. She looked at me. I asked if it was still beating and she said yes, but every 3 seconds or so. She showed me where to watch for his heartbeat and I stared. I told him everything was going to be okay and that I loved him. His pulse, slipped away. I heard a flatline sound in the hallway. The nurse who didn’t want to tell me his heart rate just a few moments ago, said it was now gone. He was gone. It was 10:20pm. It seemed fast to me. Just an hour before, he was breathing and now, he was lifeless. “He passed,” I said. “Oh he did?” she replied. I could tell she was starting to cry. We talked for a few moments and then I hung up. I called hubby next. A few minutes later, a doctor came in. He assessed Grandpa and stood there, staring at me. I said, “So he has passed?” “Yes,” he said. “I hope I did this right,” is something I would think often after leaving births. I hoped I provided a high level of service to my clients when they gave birth to their babies. And when I read this, there were so many similarities in the companioning of someone through birth and through death. We use all our senses in these situations. Oils to help relax, provide a memory imprint, to mask a smell; lighting to create a calming environment, releasing tension, submitting to the task at hand; and music to bring up memories or create them. Birth is very similar to death. It’s a transition from one environment to another; a transition worthy of support and companionship. At birth, the transitioner (baby) is never alone. At death, many of us are alone. I couldn’t imagine leaving Grandpa alone to make this transition. He had a companion with him when he opened his eyes to his new life, he would have a companion when he closed his eyes for the last time. It rained when we left the hospital. Something that doesn’t happen this time of year. It was a tiny sprinkle but noticeable. I found it significant that it drizzled, mid-winter. It was only for a moment, but it was happening. I have never companioned someone through death in this way before. I have helped families companion their dying babies and children but I have never been the companion in this capacity. It was truly an honor to be there as Grandpa made this transition and I will never forget these moments we shared together. Thank you for meeting with me about my displeasure with your organization. I appreciated you taking the time out of your busy day to meet although your heart was not open and we left on the same terms with which we met. At the time, I was utterly exhausted from 36+ hours of work that I had completed and honestly had less than 5 hours of sleep when we met. As you know, my work is very emotionally draining and can be physically taxing but you weren’t concerned with that, just concerned about how you were going to defend yourself and organization. Let me say that I was not trying to hurt you personally. My displeasure was because of many things. I addressed those with you but your heart was not open. You didn’t hear me, you were only there to defend. If I were a hospital representative who expressed those feelings, you would not have approached me in such a way. You would have been open to hearing my concerns. But I am not a hospital, I am just a person who you berated, threatened and attempted to rip apart her very core. I wanted to keep the conversation on task by trying to explore the communication breakdown within your organization but you weren’t interested in fixing that organizational breakdown and only offered for me to call you personally when your organization failed to provide. If they failed to provide, you shared you would find a way to provide. You don’t see how that isn’t really feasible and ultimately, not sustainable for you, your family and of course, your organization. Our conversation should have been about mending a damaged relationship, addressing communication failures, and coming together to provide for families but you did not see that. You came with discontent and hate towards a comment I made on my personal Facebook page. In addition, you felt assaulted because I did not involve your organization with one of my many clients. A client you should have never known I was serving and even though you did, you did not come to me. You expected me to come to you. And when I didn’t, you were offended. I apologized to you but you did not accept it. You offered no humanity, you remained cold and heartless, ripping apart all I do and comparing my loss to yours. Discounting my children by stating I couldn’t possibly understand your loss and referring to them as blobs. I took it. It’s not like I haven’t heard it before but there was no need to compare our losses during this conversation. It wasn’t about our deceased children or the grief we both carry for them. This was about your organizations failings and my businesses inability to utilize a service. Then the second piece was my sadness over something I lost from your organization as a bereaved mother. You lumped them into one big issue and refused to see either side. You were grasping at every straw in an attempt to destroy me. It was wrong and inappropriate. You said I should have come straight to you with my displeasure instead of utilizing your organizations outlet for asking questions and submitting a complaint; instead of posting something on my personal page. But why should I have come to you directly? You stated it was because we were “friends” on Facebook as if that gives me some entitlement. Maybe it does, but what about all those who had the same feelings and aren’t friends with you on Facebook? Where do they go when they feel disappointed? I suppose to your special VIP club that no one knows about. I wouldn’t come to you (the owner) no more than a Private would go to their General if they had a concern. I explained this, but you didn’t understand that concept. You continued to “one-up” me. Any situation I discussed, you presented something worse that you were involved in. Your underlying message was that I couldn’t possibly have an understanding because I haven’t been where you have, seen what you have, experienced what you have and more. We are both unique. We both have stories to tell but you didn’t see that; only defensiveness and hate. That’s what you brought to this meeting. When I shed tears in front of you because of the sheer exhaustion of my last 36+ hours, not a sign of humility appeared and you continued to thrash about, searching for oxygen to heal a wound you believe I created. No humanity; just defensiveness and continued berating of me and my profession. “Anyone can do what you do,” you said. “I can do it without any training and slap a credential behind my name,” you blundered. No, “anyone” can’t do what I do just as much as “anyone” can’t do what you do. And this is where you became such a hypocrite and didn’t even see it. I chose for my client to have a personal service, untrained by your “standards” yet trained in her own way and definitely up to serving a special case, but she wasn’t “good enough” for you because she wasn’t trained by your organization. You said your organization is “premier” with all the training and support that is received and that is wonderful. It does make your organization special. But my organization is special and premier too. It is also unique and came with an intense amount of training. You don’t see that and you won’t, even when I invited you in to share. “I have a friend that serves families the way you do and she doesn’t have training,” you muttered. Oh, but it is very important that your friend receive training. I explained that it is frustrating that your friend doesn’t have any formal training because there is so much that can be offered. Maybe your friend is offering it but without the training, your friend may not even know. Training doesn’t make one superior but it does help families. However, I see a bigger issue here beyond all that. It’s worthiness. You and your organization determine worthiness and that is not okay. It’s also discrimination at its finest. What makes someone more worthy than another? You have a manual complete with pictures and statements which determines worthiness. Your statements were sickening and heartless. 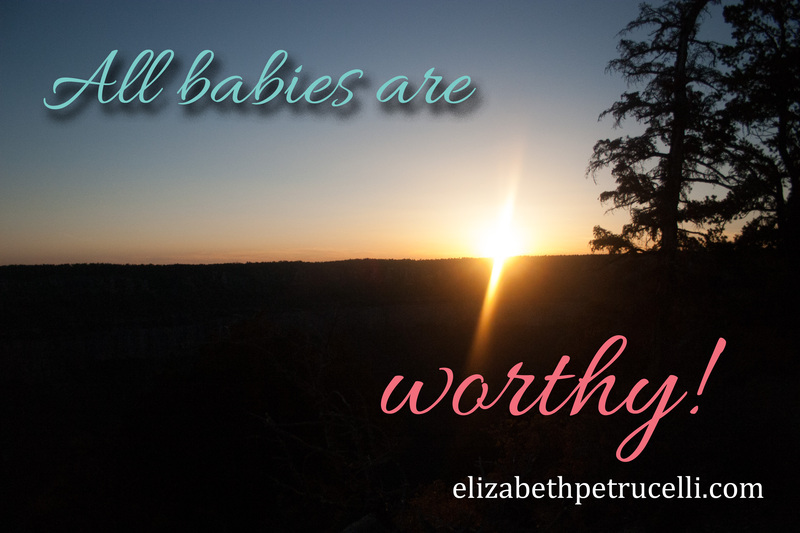 I was in utter shock to hear you placing humans into worthiness categories, no different than all the scuttlebutt with Planned Parenthood who also determines worthiness. Looks determine worthiness. Age determines worthiness. And you still question why I DIDN’T CHOOSE YOUR ORGANIZATION? I was not going to allow you or your organization to determine the worthiness of my client or any of my clients for that matter. You continued on in an attempt to defend yourself but you really hurt yourself even more. The clarity I had after sleep was so unbelievable. You told me to call you and you would personally find the right person within your organization to help, but that isn’t helpful. It’s a special club; the club where those who were deemed unworthy, become worthy. It’s not enough that they are already in a “club” but now they are in a “sub-club” and can be treated as a VIP; if you determine them worthy. But what about all those you never deem “unworthy?” Where are they left? What do they get? Oh, they can still get a box, which is much better than a bag, right? But that’s it. They aren’t offered the professionalism, just some random person with little training to fill in. You stated that this can be too hard for some people in your organization; that they leave because its too difficult. So maybe the training isn’t correct? Maybe they need different training? More training? Have you explored that? Or maybe you tell them about the worthiness and they too feel that some are unworthy, because of your standards. This is not okay. I asked where you wanted to go from here and you turned it back on me. I shared from my heart where I wanted to go with you and your organization, how much I believe in it, how much I support it but that didn’t matter. There was no thank you, just defensiveness and anger. Your heart never became soft. There was no reciprocation. You even went so far as to say that I performed a major disservice to a particular client. That if I had called upon your organization that you would have been able to provide something I couldn’t. You hit below the belt on this one although my client would not have been worthy by your organizations standards. When I asked again where we should go from here, you said you asked that question and I didn’t answer which was not true and I again explained and asked what you wanted. “Respect,” is what you said. I had respect for you but how can one have respect for you after learning all these things? You asked for personal respect, which is admiration. But you do not have qualities with which I would want to admire nor emulate. You didn’t ask for respect for your organization, you asked me to respect you. You didn’t ask me to support your organization, you asked me to support you. But after all that was revealed to me, in an attempt to show me what my clients may be missing, I cannot respect your organization. It is not all inclusive. You are not the one that determines worthiness. I am worthy. My children are worthy. Everyone deserves VIP treatment no matter how hard it is. And finally, you had the opportunity to make things right, but you didn’t. So I just want you to know. I AM STRONG! I am here and I will provide VIP treatment to all my clients. They are all worthy! I operate with integrity. I do what’s best for my clients and if not using your organization is best, then that’s what I recommend. What is a Bereavement Doula? Glad you asked! First, there is ABSOLUTELY, beyond a shadow of a doubt, a need for this occupation. The biggest concern I have right now, is how do I, and others in my occupation, get the word out to families that this is something they need. They don’t know they need it until it’s too late and then we hear, “I wished we had known about you at the time.” Even so, would they have called? Most likely they would not have called because this is not something expecting parents plan for and they are quickly overwhelmed with all the choices they are suddenly presented with. Second, what is a bereavement doula? A bereavement doula doesn’t have one single definition. She is, who she is and supports in many different ways. She is unique. But in a nutshell, a bereavement doula provides physical, emotional, and informational support to families experiencing pregnancy loss. Yes, this is a similar definition to a birth doula who provides physical, emotional, and informational support to families during pregnancy, birth, and immediate postpartum. So what does that support look like? This is where the support becomes very individualized. It depends on the gestation of the baby at the time of death and the needs of the family. For miscarriage, the support may simply be attending the doctors appointment to confirm the miscarriage, presence with her in the emergency room while she bleeds and births her baby, emotional support via text, phone, email, or instant messaging while she labors and births her baby at home, preparing her to greet her baby, bonding options for her tiny baby, explaining options and final disposition for her baby’s body, and walking with her through the grief journey after she has birthed her baby. For stillbirth, the support may include much the same as above but may be more in-depth for ensuring memories and mementos are created with a more fully formed baby. Recently, a hospital social worker stated that it was her job to support the family. There is no doubt that the hospital social worker has an important role in supporting families through loss and through the NICU experience but there are some major differences in the support that a bereavement doula provides. Some of these a social worker or bereavement coordinator can provide but there isn’t a single hospital program that can give a patient one-on-one continuous support by the same care provider for the entire length of the labor and birth. This, right here is the biggest difference between a bereavement doula and any other perinatal loss specialist. Bereavement doulas are there, no matter how long it takes. We don’t work on shifts. It’s hard work. We aren’t bound by the same laws and policies as a hospital employee is. 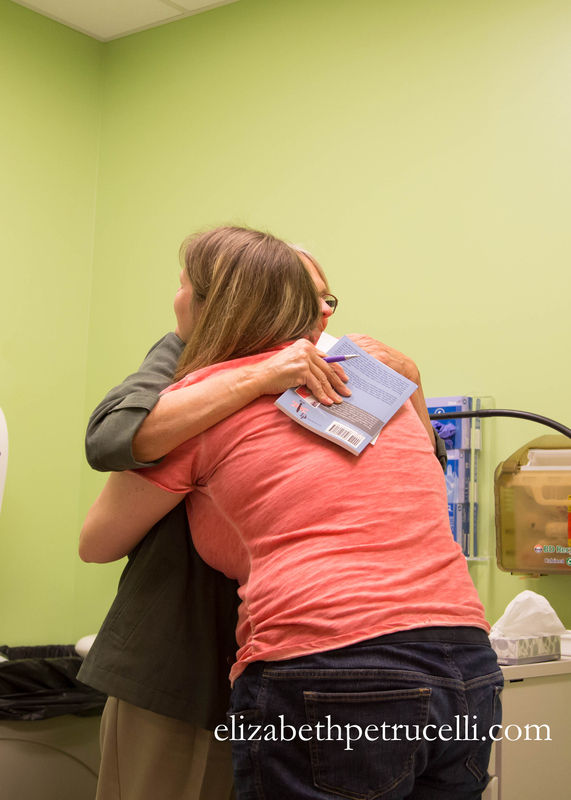 Some hospitals follow-up with their patients following loss. Some hospice programs offer regular phone calls to ensure the family is doing well and these are wonderful additions to the perinatal loss program but how many hospitals and hospice programs have the same care provider following up in-person, on the phone, via email or via text? These are some major differences and these are all aspects of support that a bereavement doula provides. It is continuous, one-on-one, support for the family through pregnancy, birth, and beyond. I didn’t touch on other services that bereavement doulas can provide such as funeral planning but that is also available too. We have so much to offer families and we have a huge network of resources and tools to help the family cope and move forward. What is it like when a bereavement doula needs a bereavement doula? The night before my scheduled ultrasound, I began to panic. Over the last few days, I had become overly concerned with going to this appointment alone. All of my other appointments, up until then, I had the support of my husband and children with me. This appointment; however, was an extra appointment and my husband was unable to attend due to a training class he was attending. His employer had paid for his attendance at this training so there was no way he could get out of it unless it was an emergency. I had no idea my appointment would turn into a psychological emergency. Due to the anxiety I had been feeling, my husband felt I should have someone attend. I have talked a bit about that in previous posts. For me however, I am so closed and it is difficult for me to let anyone into my life on such an intimate level. Finding the right person was imperative. I had a few select people I considered. The first, was unavailable. I was disappointed because I had had her with me in previous pregnancies at appointments but she has some business in her life now that prevented me from feeling like I would have an open space to find relief or experience grief if the appointment went sour. She is one of a few people I have been vulnerable with and allowed to see me cry. The second, wasn’t sure if I would let her in the way she knew I needed to. She was so perceptive and with her new family, I didn’t want to intrude. As much as I wanted her there, we both would have been a sobbing mess if things didn’t go well. Which we all now know, they didn’t. Looking back, it wouldn’t have mattered if we were sobbing. Then there was my third choice who in reality, should have been my first choice but we have such an interesting relationship that I didn’t even think to ask her until I did. When I asked her, I also felt like I was intruding but when I explained the nature of what I needed, she didn’t hesitate to be there for me. And let me tell you, with her profession, this was no easy thing for her to do. I am so glad she was able to be there for me but I am writing to share with you about what I actually did to her that I didn’t even realize. I made her feel inadequate, anxious, and concerned that she didn’t help me at all and I did this without even knowing it. She is not a bereavement doula and I thrust her into that role unprepared and with no training. When my friend met me in the foyer of the medical office building, she greeted me with open arms but her energy was one of nervousness. I brought Timmy with me and she immediately took on the care taker role which was very helpful. I think both of us didn’t really know what to do in those moments. She also felt like we would hear his heartbeat and she would be returning to work after a small scare but that was not the case at all. Then there was the ultrasound where I knew almost instantly that things were not good. I went into my own bereavement doula mode of INFORMATION. I needed information, even though I knew it. I was on autopilot. I was looking to my friend for a reaction that would tell me how to react. My friend though, instantly thrust into a role she has never filled nor was prepared for, also didn’t know what kind of reaction to give. In talking with her after, she told me she didn’t want to break down. She didn’t want to start crying because she didn’t want me to feel like I needed to console her. She wanted to be stoic so I could break down, yet in those first moments, I was being stoic. After moments of silence and a warm touch and expression of condolences from my midwife, I began to shed some tears. Some. Not much. As my eyes began to burn, my friend came over and hugged me. My feet still in the stirrups with my birthing organs exposed. Very few people would I invite into such a private moment. She held me as I cried but I still held back. Little did I know, she was holding back. She was confused on how to support me. She was confused on how to react, be, provide, and do. I put someone in a horrible position. I brought someone into a sacred space of death. The sacred space of learning about a death. Those early moments that people only imagine what a family would experience, she was experiencing it with me. This wasn’t what we planned. It wasn’t what I had first asked her to do and even though she was doing it, I was actually wrong in putting her in that role. As a bereavement doula, I had no idea that I needed a bereavement doula and that changes everything. For all the women who ask their friends to be there for support or go to these appointments alone, they are missing out on support that they deserve. My friend did an amazing job for what she was thrown into. I couldn’t have done that alone. I couldn’t have gone through all that by myself. I needed support but I should have thought enough to ask another bereavement professional to be there for me. I do feel “bad” for putting my friend in that position. Our relationship has grown and we are closer because of this experience. When she left, she took my book “It’s Not ‘Just’ a Heavy Period; The Miscarriage Handbook,” and instantly began utilizing the information from the book. She was there every step of the way and I believe that book can be so helpful for the care givers who will support families through loss. So this is what it’s like when a bereavement doula needs a bereavement doula. A trained friend or doula is probably best just so no one feels inadequate but in the absence of a bereavement doula, anyone is better than having no support. I wouldn’t change a thing about how she supported me. I couldn’t have asked her to support me any better. She even came home with me following the appointment and just sat with me which is exactly what I needed and didn’t even know it. Behind the scenes we were both confused about how we should react with each other but up front, while it was all happening, everything fell into place perfectly. WARNING – Graphic details and may not be suitable for all audiences. It takes a special person to be able to assist a family through their miscarriage or stillbirth. This isn’t something the average person can do because it’s so emotional and the family can react in many different ways. Without a full understanding of grief, the un-trained person can be taken by surprise and pass judgment on the family. I cannot train someone in all the aspects of supporting a family through miscarriage and stillbirth in this post. I have over 50 hours of formal training in bereavement and hands-on experience assisting families through their grief and until I had this training, I believed that it didn’t matter if the person assisting the family had training so long as the family had support. Now that I am trained, I know this is not true. There is so much to know. If you have no experience with death and the process the body goes through when decomposing, you may be shocked when a stillborn baby has a “nose bleed” or when the skin sloughs off. You may also not be prepared for the discoloration of their skin and nails. Looking shocked and disgusted in front a family can add to their devastation as well as their own shock and disgust. This may impede healing by thinking they shouldn’t hold their baby when in fact, they should be encouraged to do so despite any decomposition that took place in the womb. If you have no knowledge or education on hospital policies in regards to stillbirth or miscarriage, you may not be able to support the family properly in their choices. You may also negligently tell them they can do something that they cannot such as take their baby home to bury or tell them they cannot transport their baby to the funeral home themselves (these policies vary by hospital and county). You may also not be aware that in many hospitals, families are encouraged to “room-in” with their baby, just like with a happy birth and these babies are kept cool to help slow decomposition. You may also not be aware of healing options such as bathing and dressing their baby and creating memories. There is so much more to creating memories than just having photographs or footprints available. If something isn’t offered or is forgotten, the family may be extremely hurt later on when they no longer have the opportunity to make a certain memory. These are just a few areas that many aren’t prepared for when supporting a family through stillbirth or miscarriage. There is specific language that should be used so as not to hurt the family anymore than they are already hurting. It is also important for caregivers to understand that options should be offered several times and that information should be repeated since many families are in such a shock they aren’t hearing everything that is being said. Encouraging them in loving ways is important. There is so much information to know and even with training, we may not always do it right but that is no excuse not to receive training. The good thing is, there are several ways to receive training. You could attend a workshop with The Wishbone Foundation. They hold free workshops twice a year for medical personnel. Stillbirthday offers an eight week training course and certification many times each year. Stillbirthday also hosts mini-workshops with hands-on activities. Another organization where you can receive training is Loss Doulas International. This training may be available in the Denver Metro area soon. I implore each and everyone one of you who has the love in their heart to assist families through the loss of their child to receive formal training. It is imperative. It is important, and most of all, it is a disservice to the family not to be educated on what they are going through and all of their options. You only get one chance to get it right. Get trained. My bereavement services for miscarriage and stillbirth were featured at Denver Natural Mom in honor of Pregnancy and Infant Loss Awareness Month. I was so honored to be able to share. There was so much to share and just not enough time. Kathryn Roman with Denver Natural Mom did an amazing job of putting this interview together and I hope to work with her again in the future on other topics related to miscarriage and stillbirth. I can’t share enough how amazing Stillbirthday is and all they have provided for me, as well as the world, on bringing awareness and training on this common loss. If you have thought about becoming trained, stop procrastinating. Just do it! You won’t regret it. If you have questions, contact me although you can hear all about what a bereavement doula does in my interview with Denver Natural Mom. Audio of interview with Elizabeth Petrucelli on her Bereavement Doula Services with Dragonflies For Ruby. Learn about how I got into this line of “work.” It’s not work for me. It’s a calling. It’s my ministry. How common is miscarriage and stillbirth? When to tell people about your pregnancy. More about Pregnancy and Infant Loss Awareness Month. How you can support a friend who is experiencing or experienced miscarriage and stillbirth (even if they live out of state or far away). What a bereavement doula can provide. Bereavement services for miscarriage and stillbirth is still relatively new. At least certifications for it are. Following my certification, I opened Dragonflies For Ruby in honor of my daughter that I lost to miscarriage. It is an amazing journey and my services keep growing and expanding in places I never thought possible. Thank you Kathryn for allowing me the opportunity to share this with the world! If you or your organization is looking for a speaker, contact me today! How do you provide doula support for miscarriage? Doula support for miscarriage is very similar to the support you would provide for a happy birth. Many miscarriages are NOT like having a heavy period; they can be just as painful and uncomfortable as labor. I remember thinking this as I experienced my miscarriage. The pain came in waves. It was NOT like a heavy period at all and that was very confusing. So the first bit of doula support you could provide is to help the mother understand that if her miscarriage feels like labor it’s normal. Provide warm compresses, help her with her breathing, utilize aromatherapy, provide loving emotional support during this difficult time. Help her understand what she is physically feeling. Does movement feel better or does she want to lay down? Would she like to get in the bath or shower? Many of the same rules apply when laboring during a miscarriage. Can she feel the baby coming? Once the baby comes, the contractions typically subside as does the pain. She may not be able to see the physical form of the baby so the pain subsiding is a sign her miscarriage is nearly over. When it comes to the birth though, are you familiar with what her options are? She has many options even if she is delivering by D&C in a hospital or outpatient surgery center. Would she like to see her baby? Hold her baby (may not be possible with a D&C delivery)? Prepare her for what this may look like by visiting the “See Our Babies” page at Stillbirthday. Seeing her baby may be traumatizing so be gentle with her when you encourage this. The baby may not be well formed, if delivered by D&C the baby’s form will most likely be destroyed, and even if the baby is well formed, seeing such an early baby may feel wrong. It’s okay no matter what the mother chooses. It is important for you to know those options and to help her. If delivering at home, where will she store her baby? Will she take the baby to the hospital for disposal? Will she bury her baby at home (check with the county first)? Will she choose communal burial such as what is available at Mt. Olivet? After the birth, help her to know what is normal in regards to bleeding. She should check in with her care provider if she delivered at home and she needs to monitor her bleeding just like after delivering in a hospital. Soaking more than 1 pad an hour warrants a call to her care provider. Miscarriages can be very bloody. If you are comfortable, assist her in cleaning up. Tuck her into bed, bring her something delicious and nutritious to drink and/or eat; perhaps grief soup? Be a shoulder and listen. She will likely need to share her story. It’s okay for you to cry with her. This can be very healing for her as well because it shows that someone else cares about her loss. Allow her to grieve and remind her there are no timelines on her grief; it can be short or it can be long. Don’t forget to refer her to therapists or support groups. You may also refer her to Dragonflies For Ruby for online bereavement doula support or local support if you live near Denver. As a birth professional, you may also need support and someone to share your grief and story with. Dragonflies For Ruby can help you through your feelings of grief and loss as well. Visit this page for support groups and resources. If you feel more comfortable, find a local Stillbirthday Bereavement Doula for your area. After you have provided doula support for miscarriage, it may be time for you to consider becoming a bereavement doula. Did you like this post? Click the links below to share it on Facebook! Or buy my book by clicking here! I was sharing some pictures with my husband tonight from my Stillbirthday Bereavement Doula Training. We have a group on Facebook that is comprised of many of the doulas-in-training for this particular semester. It is a wonderful group of women and I am so proud to be a part of such an amazing and transpiring group. The other night, the women from the group felt compelled to share the pictures of their stillborn and miscarried baby’s. Those with the weak stomach, would feel very upset to see some of these pictures. They are raw, completed with all the details of their baby’s including the raw emotions the parents experienced at the time of their loss. I am proud that these mothers were compelled and comfortable enough to share their beautiful baby’s with all of us. It takes a strong person to feel okay with showing some of these graphic pictures. Many people who see them are appalled and some images have been reported and asked to be removed from Facebook (on other pages, not this one). I shared some of the pictures with my husband. I had to, because I needed to process my emotions from these pictures. While I was in awe at the natural beauty of human creation, I was so saddened to see these babies. My heart ached for the mothers who endured this loss. I have had a first trimester miscarriage (obviously) but I had no “physical baby” to share with anyone. In fact, I was so scared that I would see my baby, I wasn’t sure how I would react or what I would do if I saw her. Yet, I WANTED to see her. I LONGED to see her. Then he opened up. “It bothers me because those are people’s dead children. It bothers me because it’s painful to see others suffering from the loss of their baby.” Then he continued to talk about a recent funeral he attended. The funeral was for a 10yr old boy who had been made an honorary Aurora Police Officer. It bothered him dramatically. He came home in tears and had tears for several hours following this funeral. My husband is a musician (we both are) and he frequently plays “Taps” for military and police funerals (because many now use a recording). My husband attended the funeral because he was giving “honors” to this little boy. As he continued to talk, he stated, “I just couldn’t imagine leaving him.” He couldn’t imagine leaving his dead child behind. As he talked, he began to cry. It was too painful for him to even think about how hard losing a child is. He knows…he lost his only daughter (at that time) to miscarriage. The innocence was lost. I have talked about this innocence before. Most people live in it. “It’s not going to happen to me.” “It couldn’t happen to me.” “Wow, that happened to my best friend and it was really sad to see but it didn’t happen to me.” Part of that is a coping mechanism but the other part really is the fact that they have never experienced such heartache and loss. It’s not the same as losing a parent. In fact, we expect to lose our parents. It’s inevitable. We plan for their funerals, talk about their wills, etc. But, you never “expect” your child to die. You never plan for your child’s funeral (obviously there are some exceptions to this). We aren’t made to do this really. It’s not the “natural order” of things. So here I was, sharing with my husband and processing my own emotions, and I see him well up with tears and emotions because he knows what it’s like to suffer a loss. Not their loss, but his own. He wasn’t upset at all at the graphic nature of the pictures, or really the fact that they were posted on Facebook. He was upset because these parents suffered through the death of their child. No matter how early it was. He knew it hurt. Life or death in the NICU…Whose choice is it? This is going to be a very controversial post. I won’t divulge too much information about where I heard this but this has been on my mind for a few weeks. While having a conversation with NICU personnel (not at my hospital), the discussion came up about how some parents prolong their sick child’s life. Okay, now before you read on, if you are sensitive or in a place where you can’t read about loss, PLEASE STOP HERE! There were other statements too but I nearly vomited and almost left the room. First…IT’S NOT YOUR CHOICE! Second…FIND A NEW JOB! So I proposed to the group, “What is wrong with having a child in a wheelchair?” One responded, “It’s about quality of life and a parent shouldn’t be able to choose that.” It took everything in me to stay in the room. It also took everything in me from not jumping across the table to strangle this person. So basically…a parent can’t make this decision for their child and a parent has no right to allow their child to live if they might suffer from a defect/issue or be wheelchair-bound. OMG! If it isn’t up to the parents, it certainly isn’t up to you…NURSE! I told them it was on the internet. Just google it and you will find the story. The mom lied about her gestational age in order for the doctors to save the baby. (Something we should NEVER have to do. If a baby is born and trying to breathe, we should make some life saving attempts). And here is an update on Amillia for those who are wondering if she had developmental problems. And here is the story of Jonathan Whitehill who was born at 25 weeks but was only 10.9oz’s. I am sure one of these nurses would have deemed him to be a child that would be severely impaired or in a wheelchair. Unless they consider glasses a disability, they are surely wrong. Even more disturbing…we abort babies this gestational age! What is wrong with society? No. I am not naïve…I know and realize that some babies this small do not survive and if they do, MAY have developmental problems but my point is this…who are you to take that miracle away? Who are you to make the decision on if the baby lives or dies? I feel so sick to think that nurses and doctors don’t put their all into some of these babies. We are all human, I get that, but what if? The BABY should make that decision. If the baby is trying to breathe, we must try to save the baby. If the baby gives up, then we need to work with families through their loss but ultimately, PARENTS make the decision for their child. For them, making the life and death decision is devastating! For those of you still reading, what are YOUR thoughts? I spent much of today thinking about this bereavement doula journey I am on. I have been surrounded by stories of miscarriage and infant loss much of today and it’s draining so much out of me. I just want to sit and cry for all the parents who have lost a child. It doesn’t matter when that loss happened; I am grieving for you. Can we stop losing our babies? No. There will always be death and death doesn’t always come with old age. I pray each night that I get to keep my children with me. As my friend Pat reminded me so eloquently, our children are only borrowed. They “belong to Him.” Oh how she is right. Borrowed is so true. Pat lost her son not too long ago to cancer. She brings me hope. I am drawn to her and her strength and pray that I can remain positive and faithful through my own trials and tribulations. I am feeling very sad right now and I can’t sleep so I thought I would blog. I just watched a video on the life and death of a baby and I can’t stop thinking about this recent loss and how the family must feel. There are no words. I am just so sad. I think I will stop now because I really have nothing to say. Will you sit in silence with me?